Bibi Ka Maqbara is known as Taj Mahal of Aurangabad or Mini Taj Mahal or Garib ka Taj Mahal (गरीब का ताजमहल ) was built by the Aurangzeb in the late 17th century in the memory of his first wife, Dilras Banu Begum. The monument here is an imitation of the Taj Mahal at Agra. This mausoleum is also termed as 'poor man's Taj Mahal' owing to it being a poor replica of the Taj. 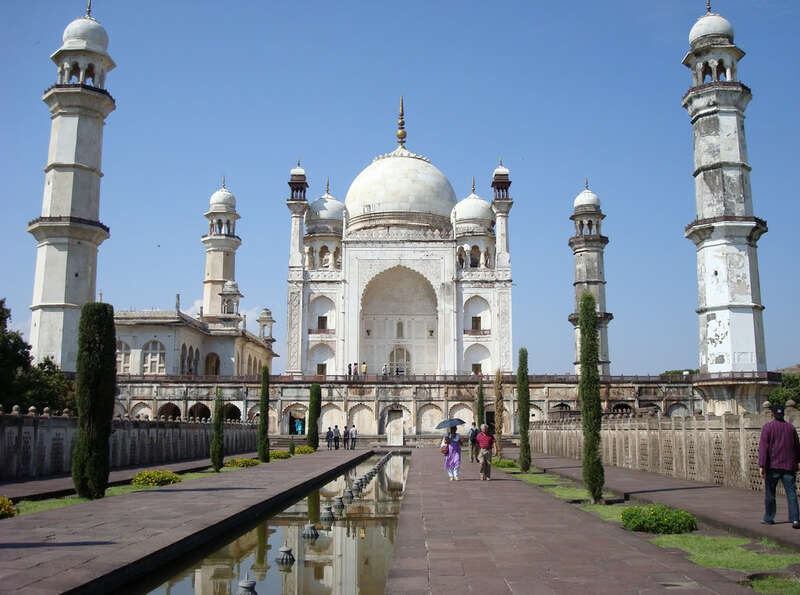 The Bibi-Ka-Maqbara is made mostly of sandstone and has plastered walls and a marble dome. However, if the delicacy of work is compared, it falls far short of the glory of the Taj at Agra. Below the tomb, lattice works are in marble. However, the lattice work and inlay decorations of flowers and creepers are beautiful. The Masjid is to the west. A high wall with bastions runs around edifice and the recesses have little minarets. The entrance leads to an arch and from this point, a fine view of the structure ahead may be obtained. The pavement that leads to mausoleum is flanked by oblong reservoirs. The interior decoration has nothing comparable with the great architectural wonder at Agra. Yet a comparison apart, Bibi-ka-Maqbara has its own splendour and grace. It is considered as a fine piece of Moghul architecture in the Deccan region.